The November garden feels very much this old watering can, it has seen better days! We have had a number of storms pass through this month. The wind has been the strongest since we moved here over four years ago. The gusts have reached around 60 miles per hour, it has caused damage with several panes of glass breaking in the greenhouse, battering a fence panel and uplifting concrete holding the fence panel in place! We have learnt that the easiest way to remove the shattered glass is to use a high power hoover! The garden is still looking green in the borders and the stalks of the sedum still look attractive close up. but a bit more messy from a distance! The garden needs some tidying up, weather and time permitting. I have noticed on the brief periods I have been outside that some spring plants are already producing buds, is that the same in other areas? The number of migrant birds passing through also seems down compared with other years, maybe it is because of our changing weather conditions. 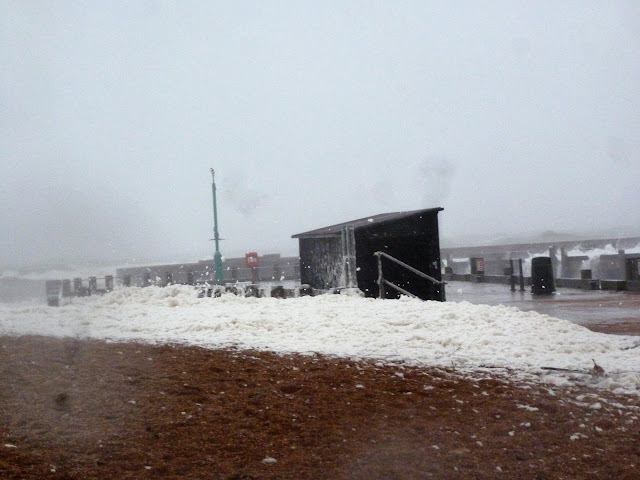 Yesterday's storm created a blanket of foam against the black hut in the harbour and it wasn't a day to be outside! These views were taken with a long zoom camera so we were much further back than it appears. It was difficult to stand or keep the camera still! How has your garden been this month? If you would like to join in with Through the garden gate each month please let me know in the comments below and I will add your site. Hi Sarah - we are in Scotland at present - our garden here is dying back slowly though I found a Candleabra Primula in flower by the pond. It is calm today but of course we are in the middle of all the activity here for the missing couple whose car was found on the beach just along from our cottage. The weather on Wednesday was treacherous and although sunny for most of today it is bitterly cold. Trump reckons there are no changing weather conditions- he should be here in Scotland at the momemt this is the worst we have ever known it - not sure how long the sea defence walls will last with the batterings they get now. Those little boats look quite vulnerable to those high seas. A bit grim to have your greenhouse shattering. Hope it is all fixed now. We are under snow here, Sarah. I finished the garden after the first snowfall several weeks ago. Winter is much too soon this year. Dearest Sarah, good morning! It looks as if your coastal areas have been effected as much as those here in the states, with unusually high winds, rain and damage. I hope your garden will flourish come spring! Our garden is resting under a gentle blanket of snow, and we did have a large tree removed from the center of our boxwood garden. An old, weathered urn now takes the place of the tree, and a Spruce tip now acts as a Christmas tree. Gentle, green and festive. Enjoy your holidays! It rattled to and fro. The gate I used to know. The crumbling wood and rust. Its pieces turned to dust? As I had done before. The way I did back then. The place I've come for years. I felt you there somehow. Twas then I came, at last to peace. A place unknown till now. A place from where no man returns. I found you there at last. Many plants in my garden are from and remind me of my mother. My goodness Sarah the storms sound dreadful... and obviously have done so much damage to the garden. It is good to see you have a bit of greenery left. Keep warm! 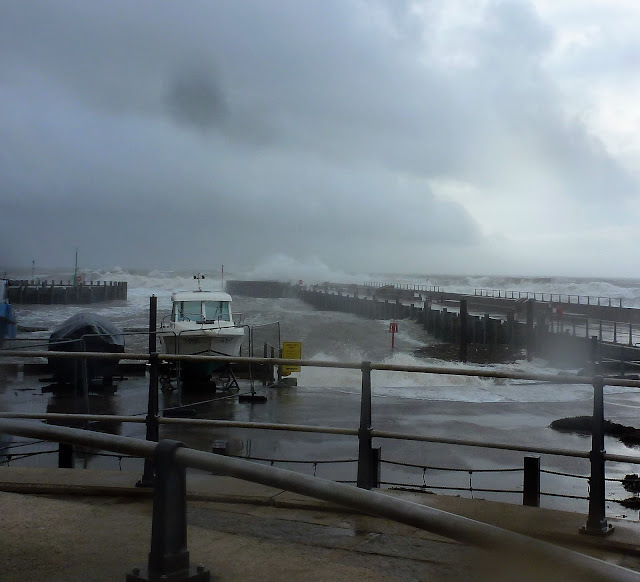 Well, West Bay looked pretty wild that day, I imagine it was both exhilarating and alarming at the same time. I notice quite a few trees with buds and catkins on preparing for next spring, it reassures me that renewal is occurring! I love all the posts you publish ! The photo with all the foam looks great and the last photo with the water splashing high looks spectacular! Hope you're doing fine! Stopped by to wish a Merry Christmas!! I hope you have recovered from the destruction.